The biggest question many voters have in mind for the impending General Election is probably this: what will happen in the event of a multi-cornered fight in the Marine Parade GRC? Workers’ Party (WP) has stood firm on its decision to contest the ward; the National Solidarity Party (NSP) may also contest in the same ward after failed negotiations with WP, pending further announcements after the Monday (10 August 2015) deadline it issued to WP. Although WP had won by a substantial 11% margin in the multi-cornered contest in the 2013 Punggol-East by-election, there are grounds to believe that conditions are not as favorable this time in the Marine Parade GRC. This is to say that more than one opposition parties contesting the ward is likely to split the votes of pro-opposition supporters to the benefit of the PAP. 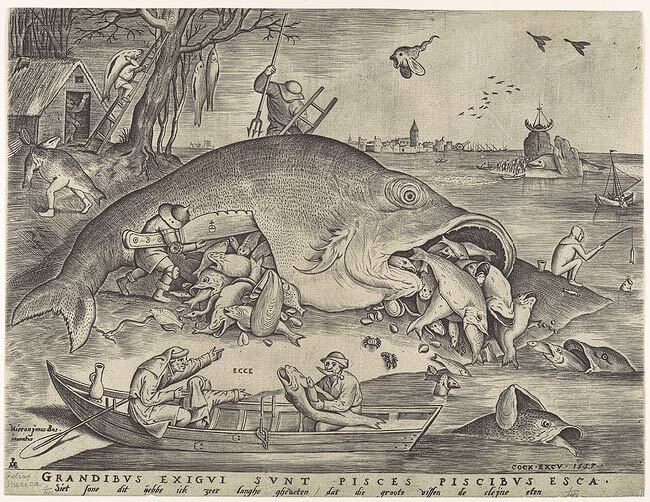 We can make use of various information available on the internet to come to this conclusion. First, let’s figure out the boundaries of the Marine Parade GRC. Thanks to brilliant gerrymandering, we now have a Marine Parade GRC (and other constituencies) with the most befuddling boundaries. To get an idea of where the hell Marine Parade GRC is, refer to this Google map. Bear in mind the above are estimates because the boundaries of the Marine Parade GRC do not exactly tally with those of the planning subzones. 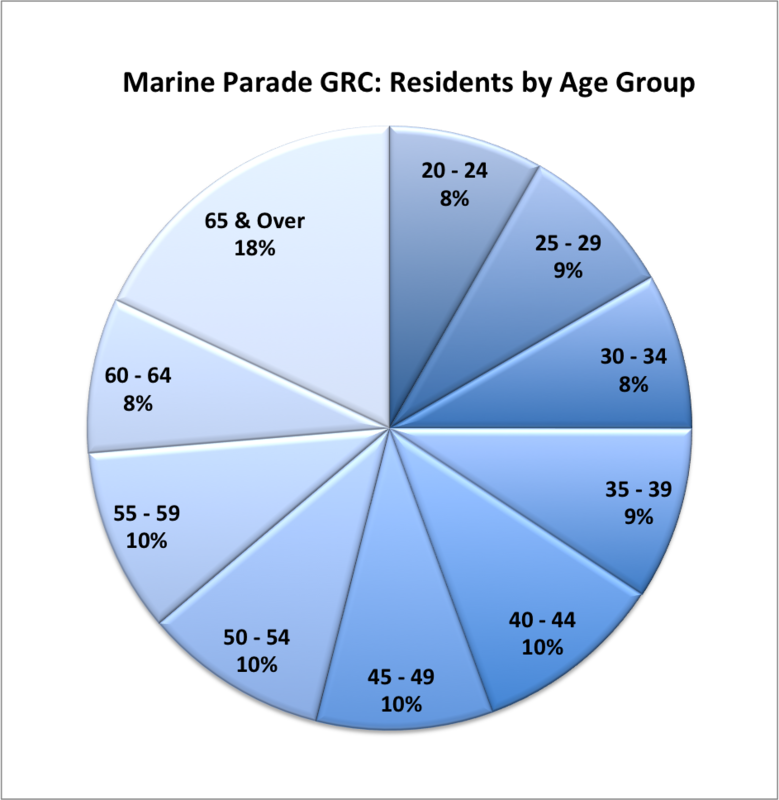 Nonetheless, based on the charts, we may gather that residents in Marine Parade GRC are older – 46% of them are above the age of 50. 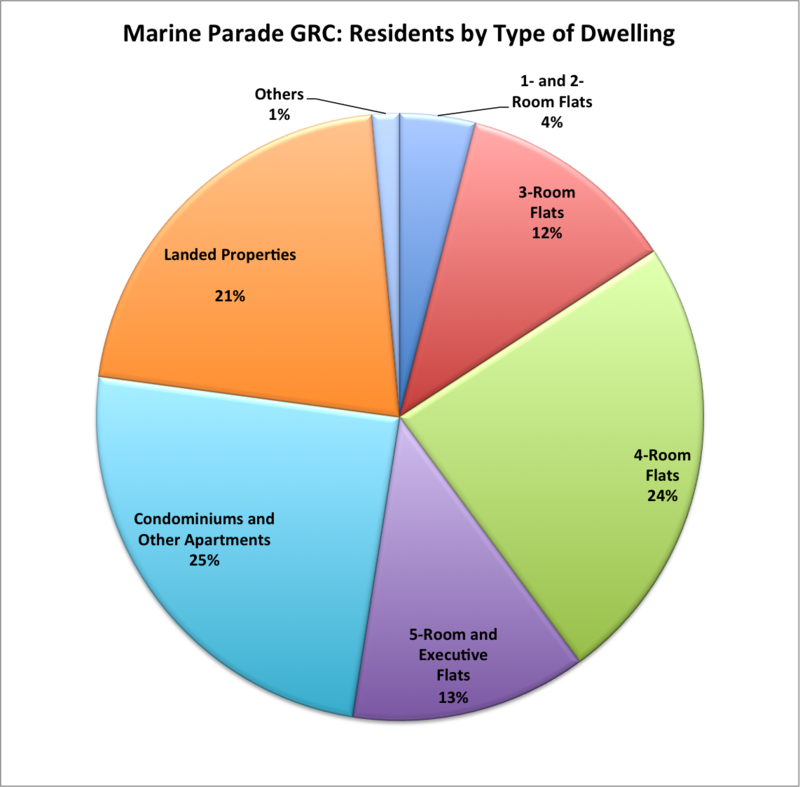 In terms of the type of dwelling, 16% of Marine Parade GRC residents live in 1-3 room HDB flats, 24% in 4-room flats, and 60% in 5-room and executive flats and other private residential property. Residents in Punggol East, in contrast, are much younger, with only 24% above 50 years old. Furthermore, there are no 3-room flats in Punggol East, where 40% of residents live in 4-room flats, and 60% in 5-room flats, executive flats and other private residential property (see report). As housing type is tied to income level and occupation, we may infer that residents in Punggol East are of a higher socio-economic status than those of Marine Parade GRC. We may also say that Punggol East residents are predominantly of the “service class” (senior executives, professionals, technicians and supervisors), and of the “intermediate class” (clerical and service workers) instead of the “working class” (operators, semi-skilled and unskilled workers), by the classification IPS uses in its 2011 post-election survey. The higher the socio-economic status, the more “pluralist” the voter (simply speaking, a pluralist believes that there should be no monopoly of political power) (44, 49). PAP is more credible in the eyes of the working class and older voters aged 40 and above while opposition parties are more credible to post-independence voters, especially those between 20 to 39 years old. WP is most credible to the service class and the most highly educated (37). Therefore, it is quite evident that the demographics – a younger and better-off electorate – that worked to the advantage of the WP in the multi-cornered contest in Punggol East, are largely absent in Marine Parade GRC. This does not necessarily mean that the majority in Marine Parade GRC will vote for PAP. It does mean, however, that opposition party supporters in the ward may not be astute enough to channel their votes to a single opposition party in the event of a multi-cornered fight, as what happened in the 2013 Punggol East by-election, where the vote share of WP, PAP, Reform Party and SDA breaks down to 54.5%, 43.7%, 1.2% and 0.6% respectively. It was a relief to many opposition party supporters that the Reform Party and SDA did not do much damage to the winning chances of WP in Punggol East. In view of the demographics of Marine Parade GRC and WP’s decision to contest the ward, however, NSP should think twice on whether it should also join the fray. Being the weaker party of the two, if the NSP insists on contesting the Marine Parade GRC this time and, as a result, splits the votes of opposition party supporters such that PAP wins by a small margin, it will, for sure, incur the wrath of pro-opposition voters. And that is akin to committing political suicide for the party. So think very hard, NSP. After 4pm and over the next two hours before the karung guni man called it a day, elderly cardboard collectors began trickling in from the two roads that lead to the collection point. Bathed in the golden rays of the evening sun, the old folks pushed their cartful of flattened cardboard slowly forward with a doggedness that belied their frail and scrawny appearance. On 2 September, the local Shin Min Daily News picked up the story of a Chinatown cardboard collector that first appeared online (watch video). The 67-year-old woman, who has been collecting cardboard in Chinatown for around 18 years, lamented that more Chinese nationals have been competing with her for discarded cardboard of late, drawing up “turfs” that are off limits to her and even threatened to hit her. These foreign cardboard collectors, according to the old lady, appeared to be less than 60 years old. Karung gunis who buy cardboard from scavengers said that the foreign cardboard collectors hold other low paying jobs and are moonlighting for extra income. Some may not even have a work permit (“阿嫂投诉： 中国‘加龙古尼’ 抢纸皮还要打我,” Shin Min Daily News, 2 Sep 2014). In response to my previous blog post on our incumbent MPs’ (Members of Parliament) attendance in Parliament, some readers on The Online Citizen’s Facebook page brought up the issue of MPs’ directorships. They attribute MPs’ frequent absences in Parliament to the number of directorships they hold. Are the MPs having too many commitments? Shouldn’t there be a line draw something like a MP can only hold 1 full time job or 5 directorships etc, if not, given one day only has 24 hours, how can they have the integrity and still managed to hold so many responsibility [sic]? The problem is that MPs are part timers. The constitution must be amended to ensure all law makers are full timers. One will truly see who are the committed ones and the parasites. We as citizens should demand this type of Parliament. We want full timers to look after our interest and not part timers or even no timers to sit in Parliament as MP and yet hold multiple directorships. The ones that hold multiple directorships to me are in Parliament for self gain. Before being MP maybe no directorships but after become MP have multiple directorships. Am I the only one to smell something is not right? Which ever MP holds multiple directorship “kee chui” and please don’t stand for the next election [sic]. Now according to the “Rules of Prudence” issued by the Prime Minister’s Office after GE 2011, “[PAP] MPs are expected to attend all sittings of Parliament.” PAP MPs have to seek the permission of the Party Whip and inform the Whip if they have to be absent during a sitting (see rule no. 23). The current Party Whip is Gan Kim Yong, who is assisted by his Deputies Amy Khor and Teo Ho Pin. It is not known if the Whip had indeed been notified of the absences. How Much Damages is Enough? unless you repute yourself such a loser. Under Singapore law, damage to reputation is presumed in a claim for libel. The award of general damages is primarily to compensate the plaintiff for the consequences of the defamatory statement. It serves to “console the plaintiff for the hurt and distress that has been caused by the defamation” and “redress … the harm that has been caused to his reputation and as a vindication of his reputation” (“Damages in defamation: what is considered and what is awarded?”). Nonetheless, the plaintiff does not have to prove that he has suffered emotional injuries or actual damages to his reputation as a result of the defamation. On 16 February this year, about 100 Hong Kongers marched on the streets of a popular shopping district to call for curbs on the number of mainland China tourists. Their demand is very reasonable for a city as land scarce and overcrowded as Hong Kong: last year, there were close to 41 million mainland visitors to Hong Kong, averaging 112,000 visitors per day and more than five times the city’s population of 7.2 million. Taiwan, which is 32 times the size of Hong Kong, has a daily quota of 3,000 mainland tourists. Unfortunately, the protestors’ rightful cause was marred by the language used: they called mainlanders “locusts,” a label that first appeared in the infamous locust advertisement in 2012. Top government officials quickly attacked the “anti-locust” protest for “tarnishing” the city’s image; one went as far as condemning the rally as “barbaric and uncivilised activities” that ran counter to Hong Kong’s values. The same official who has such strong words for the protestors, however, has not uttered a word in the unfolding and escalating saga over a mainland boy defecating on a busy street in Hong Kong (see video at 1:34). One oft-cited argument in defense of a high percentage of foreign faculty and students in Singapore universities is “global competitiveness,” which is, presumably, measured by the ranking of our local universities in the world. Our top local university, the National University of Singapore (NUS), currently ranks 22nd in the 2013 World Reputation Rankings published by the Times Higher Education (THE). Let’s look at how much the internationalization of NUS’s faculty and students contributes to its 22nd position. THE ranking uses 13 indicators grouped under five categories. You can see from below that “International outlook” is worth only 7.5% out of the overall score of 100% (see methodology). FTA Negotiations: A Black Box? At the time of writing, Taiwan students have occupied their legislature for 14 days; on Sunday 30 March, hundreds of thousands flocked to the streets of Taipei in support of the Sunflower Movement led by students (see photos here). 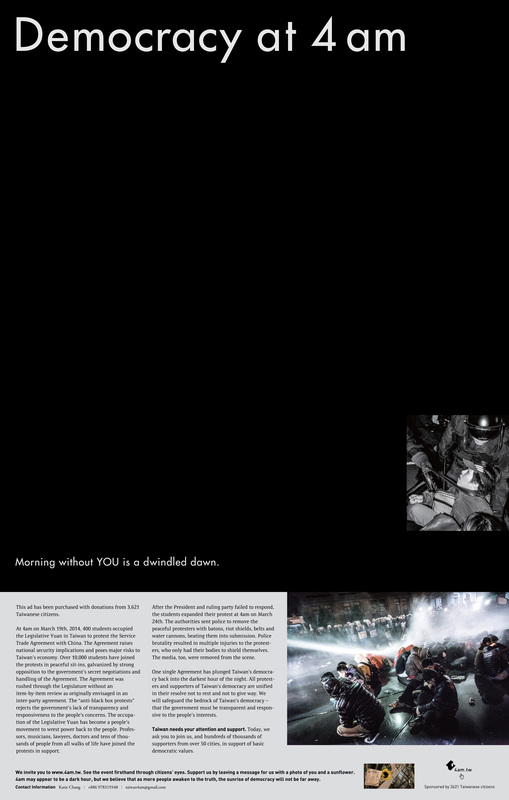 Citizens have also crowdfunded full-page advertisements (see image below) in the International New York Times. Ahhh I see, Minister. Thank you for enlightening us “ordinary” Singaporeans, who not only have plebeian tastes and neither consume imported cheese, filet mignon nor don “Burberry-type raincoats,” but also lack the intelligence to understand that Singapore’s rocketing cost of living as measured by EIU does not affect us commoners.